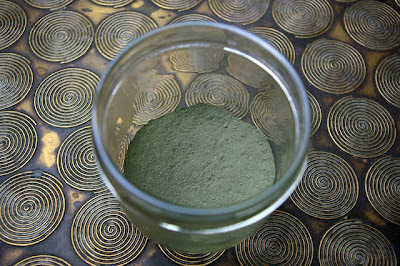 Green earth or terre verte is another historic earth pigment. It has been in continuous use for thousands of years, particularly for Medieval wall paintings. 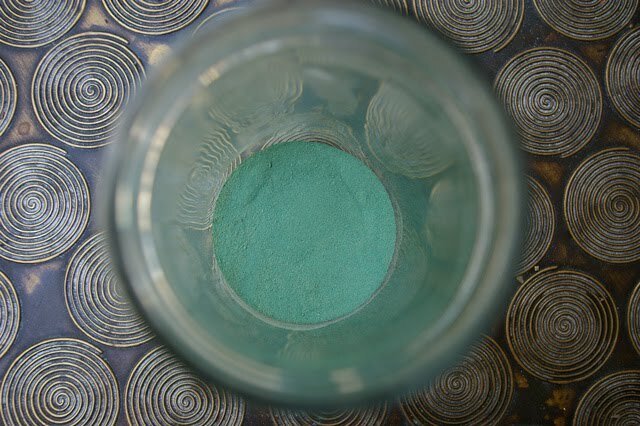 Green earth is an iron oxide pigment. It derives its green color from the addition of complex silicates, such as celadonite and glauconite. The exact color of green varies based on the different proportion of these minerals. The best varieties are mined from Italy. I could have bought the imported color, but I wanted to find a local source. What I never expected, was that my source of this color would end up being fertilizer! My mother, an avid gardener, suggested I look at a bag of fertilizer she had just purchased. 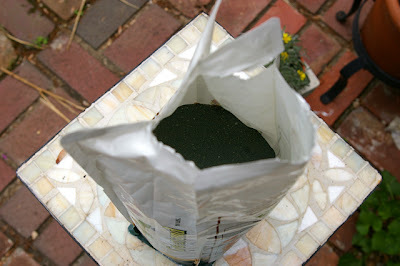 The bag was full of Greensand, a natural product made for organic gardening. At first I was a little skeptical, so I put the idea aside. I made a mental note to revisit it at some point. A little research and a consultation with a geologist friend gave me the answer I was looking for. Greensand is mostly glauconite, a version of green earth. I went ahead and prepared a sample. I prepared the green earth exactly the same way as the other earth pigments. I washed the sandy powder. Then I levigated it, collecting only the silt, and set it out on a plate to dry. 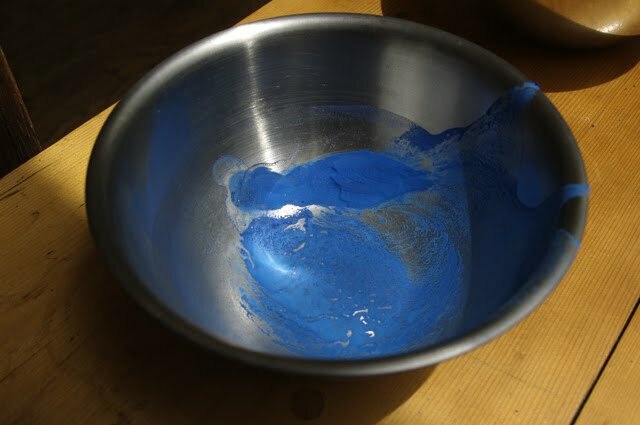 The finished pigment. This variety is more of an olive, pistachio variety of green, at least without oil. I recently bought a new palette. I put on several coats of linseed oil and let it dry. These are all of the colors I've made so far. Azurite is a blue copper mineral, directly related to malachite. They are nearly identical chemically, only very small but important differences make for the color difference. The two minerals are similar enough that they can often be found surrounding each other in the same rock. In fact, given enough time, azurite would eventually become malachite if left alone in nature. Nowadays its easy to take for granted the large selection of blue pigments at our disposal. Several hundred years ago choices would have been more limited. Azurite was the cheapest and most available mineral source. It was for the same reasons I chose to make my first blue from azurite. The color of azurite varies considerably, depending on how it is ground. 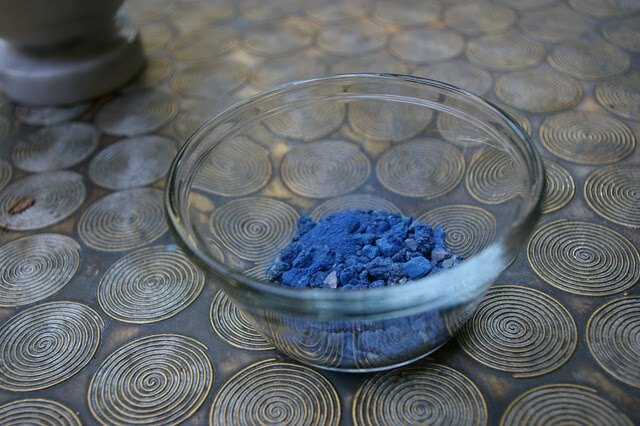 When it is coarsely ground, like a fine sand, it is a very deep, royal blue. The finer it is ground, the paler it becomes. Painters could choose to take advantage of this quality. 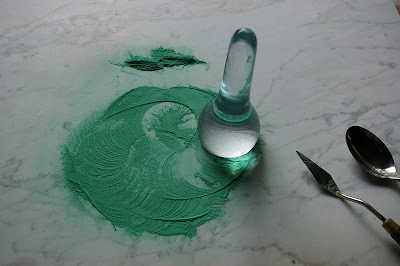 To make my pigment, I used the same levigation technique as I did with malachite. This would provide me with several different particle sizes. The azurite as purchased. This was a nice sample. It was easily ground into a coarse powder. I added the dilute egg yolk solution. I decanted the mix a few times into separate bowls. The bottom bowl is leftover. The discolored gray appearance is due to impurities. I poured off the rest of the liquid, removing most of the impurities. You can really see here how the color of azurite varies depending on how fine the grind is. I repeated the refinement process several more times, regrinding the powder slightly finer each time. Update: I was having some problems with the egg-yolk solution. Separating the finest particles from the leftover protein was difficult. I've switched from using egg yolk to a casein solution. 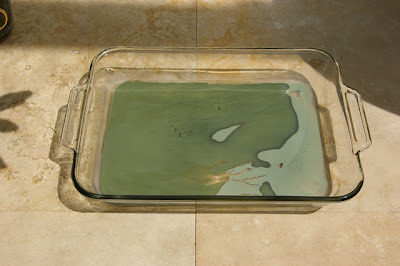 I made a textbook tempera casein solution and let it sit overnight. 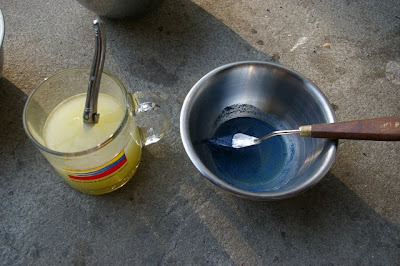 The next day I highly diluted the mixture and then used it to levigate freshly ground azurite. This change has allowed me to separate the smallest particles much more easily, with less waste. I was surprised by the beautiful new purity of color I was able to achieve. I don't normally use a green in my palette. In the past, I've made my greens by mixing yellow and blue together. So I thought it would be fun to make a new color, and try out some new preparation techniques at the same time. The Old Masters would have had limited sources of green pigments. Bright greens would have been derived from copper. 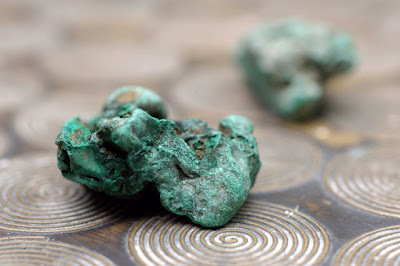 Malachite is a mineral form of basic copper carbonate. A cheaper synthetic copper green, known as verdigris, was widely used as well. This was made by tarnishing copper. A sheet of copper was placed inside a jar full of vinegar. 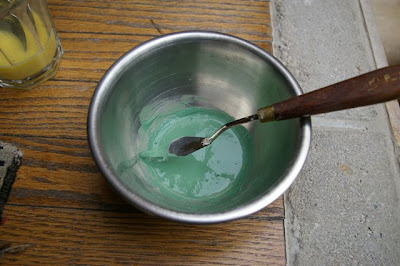 The green that formed on the surface could be scraped off and ground into a pigment. Verdigris is considered inferior to the natural mineral, so I chose not to use it. Malachite has a blueish-green color, very similar to the patina one finds on copper metal left outdoors. Malachite is lightfast, but sensitive to the acids found in oil paint. This fact has lead many experts to not recommend its use. However, it's well preserved in many Old Master paintings, so there is reason to believe that some of these concerns may be misplaced. There is evidence that in more well-preserved pictures, copper pigments were coated with some kind of protein. This protein formed a protective barrier around the pigment particles that stabilized them. I came across a treatment along similar lines developed by the artist Michael Price, and decided to try it. The basic technique is a process known as levigation. It takes advantage of the fact that larger particles are heavier and settle more quickly in water than smaller ones. You add water to the pigment, stir the mixture , and then pour off the contents. The larger particles settle quickly and are left behind, the finer go with the water. 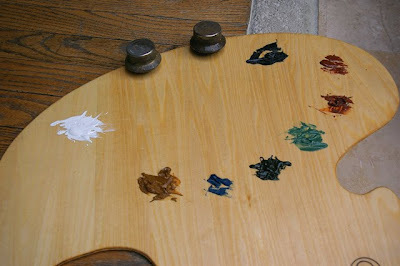 With this method, one can separate a pigment into a whole range of different particle sizes. In practice, its difficult to get a very precise separation. By adding protein, we are able to make this method more effective. The source of our protein will be a solution of eggyolk and water. 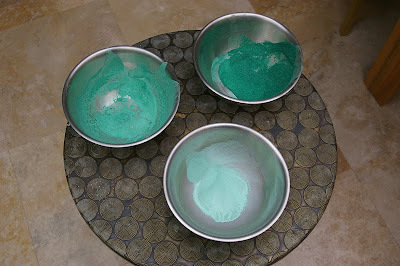 The malachite is first crushed into a coarse powder in a mortar and pestle. 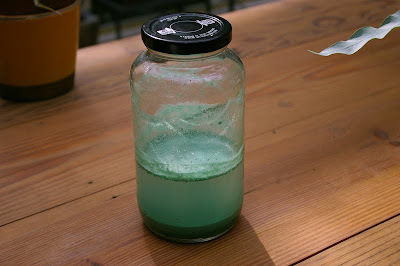 This powder is washed in water several times, then allowed to dry. Malachite is moderately toxic, so I always wear gloves, a respirator, and work outside on calm days. Crushed malachite being washed in water. 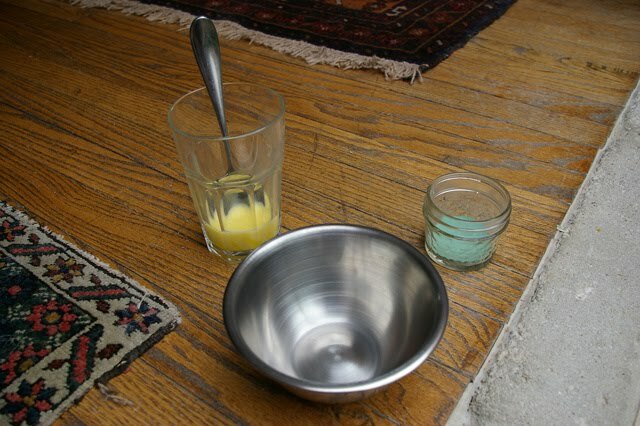 I prepared the water/egg mix. 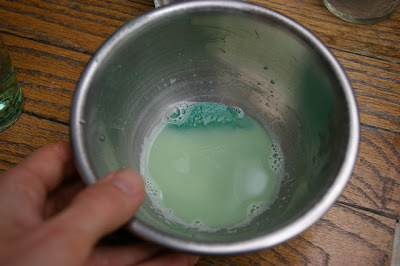 I slowly added the mix into the malachite and stirred them together. You can see desired effect as I tilt the bowl. The larger particles have settled to the bottom. The liquid is then poured off into another bowl, leaving the sediment at the bottom. 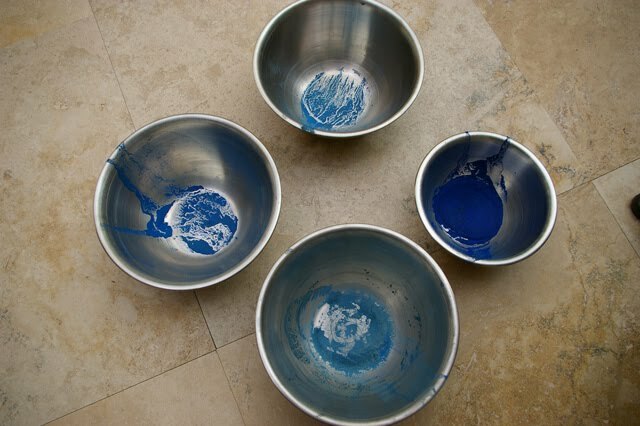 The process is continued over and over again, creating more and more bowls full of finer and finer particles. They are left to dry. 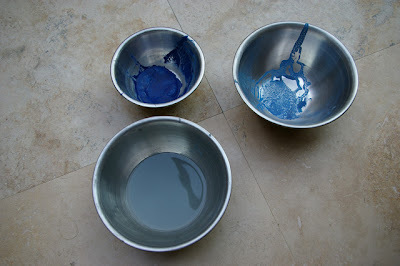 After they had dried, I went back and reground the coarsest pigment again. The malachite is ground on a marble slab with a muller. This was followed by more protein treatment. I ended up repeating the whole process over again three times. I'm very satisfied with the final color. I feel it was worth all of the work in the end.